Ihu’s Breakaway Falls is getting ready for the grand opening, taking place less than a week from today on May 9th. 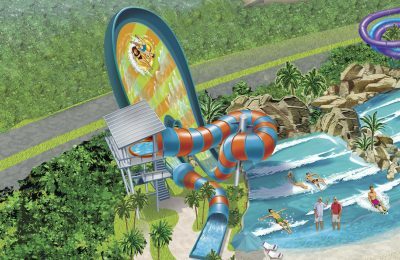 With the grand opening so close, Aquatica has announced dates for Annual Pass Holders to come out and experience Ihu’s Breakaway Falls before the general public will get the opportunity to drop feet first from the breakaway boxes. We headed out to Aquatica this morning despite the weather to check out Ihu’s Breakaway Falls. To our surprise, Aquatica was pretty quiet this morning, giving us plenty of opportunities to ride as many times as we wanted without waiting in line. While we weren’t able to take very many photos today, we still wanted to share our experience as Ihu’s Breakaway Falls is a great addition to Aquatica and may quickly become one of guest’s favorite attractions. For starters, Ihu’s Breakaway Falls doesn’t seem as tall as it really is. 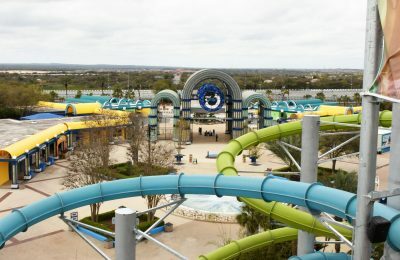 Aquatica did an excellent job with the perspective of the attraction. While 105 feet sounds like a lot, it doesn’t look very tall… until you start climbing those stairs. I tried three of the four slides before I decided I couldn’t do the stairs again, so I decided to pass on the purple slide, which is the slide that does not have a breakaway box. I carefully chose the orange slide first as it looked to have the longest drop, so I stepped into the tube. They closed the tube and that’s when I started to freak out. Me freak out? Yep. This makes a first. The atmosphere of the platform and breakaway box was enough to enstill enough fear to make me not want to do it, but I knew it wouldn’t be so bad once I actually did it. Heart pounding, I gave the thumbs up and the countdown started. 3-2-1-and down I went! I don’t know if it was the adrenaline or what, but once the countdown ended, the floor was suddenly gone and I was falling. Once the drop was over, it was all downhill from there. I twisted, I turned, and I splashed down! I had so much fun, I tried each of the three slides with a breakaway box. 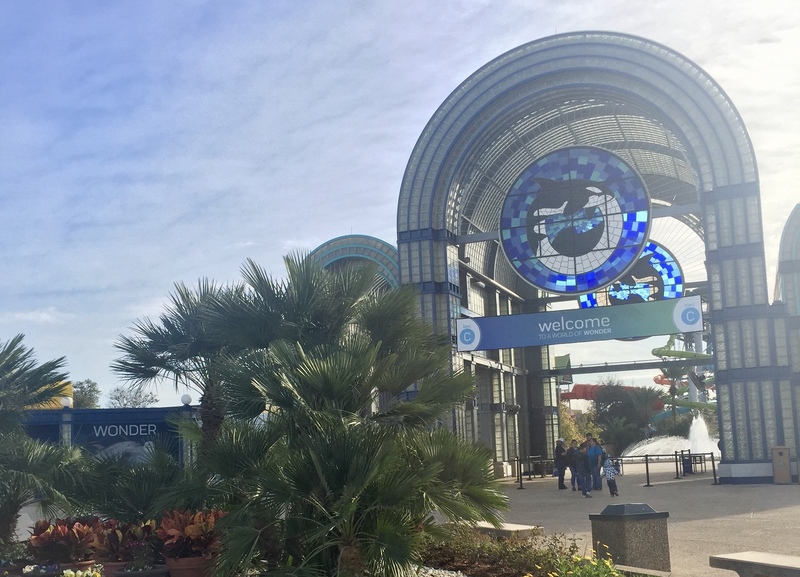 SeaWorld did an excellent job with the atmosphere of the ride. At the top platform, they play the sounds of a heart pounding, and then it’s completely silent in the box. My heart was pounding so loud I think I could hear it. I have never felt so intimidated by a ride in my entire life, but it was completely worth facing my fear because I had so much fun in the end! I can’t wait to go back and try the purple slide without the breakaway box to see how it compares to the slides with the breakaway boxes. Aquatica is ready for Ihu’s Breakaway Falls to open next Friday. They have already started putting merchandise for the attraction out in their main gift shop, Kiwi Traders. There are still two more days of annual pass holder previews left. If you have a pass, these next two preview dates are the perfect time to go and ride before it opens next Friday. When you arrive at the park, head to the ticket window and show your annual pass and a photo ID to redeem for your wristband. Wristbands are on a first-come, first-serve basis and are limited in quantity, so be sure to arrive early to get your wristband. Ihu’s Breakaway Falls will be open to annual pass holders with a wristband on May 4 and May 7 from 10am until 2pm. If you can’t view the slideshow, click here. Be sure to join in on the conversation by using the hashtag #BreakawayBrave.